As with many people in the United States and world, this Sunday is a very special time for me. Easter is quickly approaching and there are a number of music resources available for free on the Internet that can help musicians find musical ways to celebrate it. TheOpen Hynmal is one of those resources and a GREAT one it truly is. Found at http://openhymnal.org, Brian J. Dumont has been maintaining the hymnal and exploring copyright information on this site to make sure that the Open Hymnal Project is available to all and everything available within it is both free and legal. There are many public domain hymns available and the print is very nice. Each hymn also includes quite a bit of information about the author and/or translations. The site includes a general hymn index, a topical hymn index, and a section for new hymns. In addition, there are a number of special editions available for quick download i.e., Christmas and Lent/Easter Editions, etc. The Web site also includes a site specific Google search bar to quickly find specific hymns. 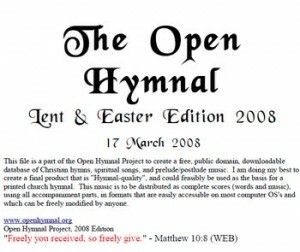 The hymns are able to be downloaded as PDfs, Midi Files, or ABC Plus music files. The entirety of the collection is also zipped for convenience of download. Here is a direct link to their Lent/Easter Edition PDF. In addition, they also have a very nice link section that will guide you to other similar and related Christian music-based Web sites. I hope that you all may enjoy this resource and wish all those celebrating the Easter season a happy one!